Polls are open until Thursday, March 27th, 2014 at 11:59 PM EST. Enjoy! Still haven't played LBW or $enoblade, yet. So this ended up being pretty easy for me. Prime vs. Returns is pretty rough, but I have to give it to DK because Prime actually made me seasick the first time I played it. Only game that's ever done that. Never forget. Links Awakening vs. Minish Cap? Eh, tossup. I like DKCR, but I haven't beaten it yet and the difficulty spikes drastically around "Cave." Metroid Prime however was a pretty good run for a while until it grated on me. And the other games that came after it just got worse. I like Metroid Prime. Link to the Past has a chance to runt his whole tourney; we'll see what happens. Two games I've never played, but Link's Awakening (as I understand it) is closest to Link to the Past, and I remember the owl on the cover of my Golden issue 50 of Nintendo Power. I first saw it over at Mike Sipniak's house while playing American Gladiators and Tecmo Super Bowl on SNES. Xenoblade hasn't grabbed me like everyone else, but Super Mario Bros. has grabbed everyone around the world. Edit: Hey, I voted the same as Mr_Mustache! I know you hate playing on handhelds, but you should get a Super Game Boy or Game Boy Player to play Link's Awakening. I'm afraid lack of exposure may doom LBW and Xenoblade. Not that I think either one would necessarily win otherwise, but it would at least be closer. Between the two I have higher hopes for Xenoblade, which would be nice because non-Zelda/Mario games will make future rounds more interesting, I reckon. Yeah, I kinda had the same thought. But I still can't bring myself to vote for a game I haven't ever played over a confirmed all-time classic just to keep the game interesting. I'm going with my gut. And my heart. Link's Awakening: don't I have enough stuff to play?! HAHA, I didn't even open DKC:TF yet! OR Galaxy 2! Before the last few polls (outside of this tourney), I really think Final Fantasy III and Chrono Trigger really have a shot at sweating Ocarina. However, I think lack of exposure may doom them, too. RPG players are a passionate bunch, but they appear to seem too foreign to people not directly invested. I think they're both better than Ocarina, and have no problem calling Ocarina a great game in the same breath. Yea I wouldn't taint the results by voting that way either. Both games are 10s to me, but Xenoblade wins out. And there's at least two games I would vote for over OoT. You guys just have to get them into that position! This one was easy for me. DKCR is good but nothing mind-blowing like Metroid Prime, LBW is no LTTP, I never played Minish Cap, and the original Super Mario Brothers has been far outclassed. I don't know that Metroid Prime holds up for me anymore. I bought and dabbled with MP Trilogy a few months ago, and man, it was a struggle just to get to Tallon IV. And then when you get there, the game zooms in on those N64-quality plant textures...either my tastes have changed more than I realized, or Metroid Prime is just less fun than I remember it being a decade ago. 2D Zelda will never be the same for me after Link Between Worlds. I tried to go back to Link to the Past. I couldn't. LBW has set the bar to new heights. Link's Awakening barely squeaks by the also-excellent Minish Cap thanks to its lovable quirks. Still haven't gotten around to playing Xenoblade. I just dread starting long games anymore. DKCR is great, but the original Prime is still one of the best games I've ever played. It's hard (and weird) to vote ALBW over the original, but everything new that it brings to the table is executed so damn well that I felt too compelled to vote in its favor. Original SMB is a classic. The first video game I ever played. 3. I think technically Minish Cap is the better game, even if LA has a more iconic status. I think I'm an outside voter here though. 4. I'm not sure Super Mario Bros can quite pull it's weight agsinst later gen heavy hitters anymore. 1: I've not played DKCR but MP is perfect in so many ways I find myself hard pressed to believe DKCR could be better. 2: I'm in a minority when I say I dislike ALBW. It felt too much like a remake/reimagining when we were promised a sequel, and those false expectations killed it for me. I can't see it as anything other than ALTTP with a fresh coat of paint. Plus I didn't like the item rental, or the lack of a dungeon order, oh, and said dungeons were all extremely short. 3: Hoo boy, two great games by all standards, but LA stands out as one of the more original Zelda games to me. It's story, characters and pacing, the whole of Koholint island. Plus the ending is a real tear-jerker. And for all of this, I consider it superior to MC. Oh, and lastly, 'Mt. Tamaranch' music anyone? Amazing tune. 4: This one I'm torn on. I've played both, yet of the two not finished XC. I actually felt like I had an overload with that game from how much there was to do, and how big and expansive the areas to explore were. Though what I did play (30-ish hours), blew me away. Due to this, I gotta give it to XC, I feel like I barely scratched the surface with it and I believe so much is waiting for me. A2. AAAAAGH! This is the new hardest choice. It's made especially hard because the games are so similar. With something like Minish Cap and Link's Awakening, I can easily tell which one I like more because they're different. But these two games have so much in common. Um... Link Between Worlds. It really depends on which day you ask me. B1. 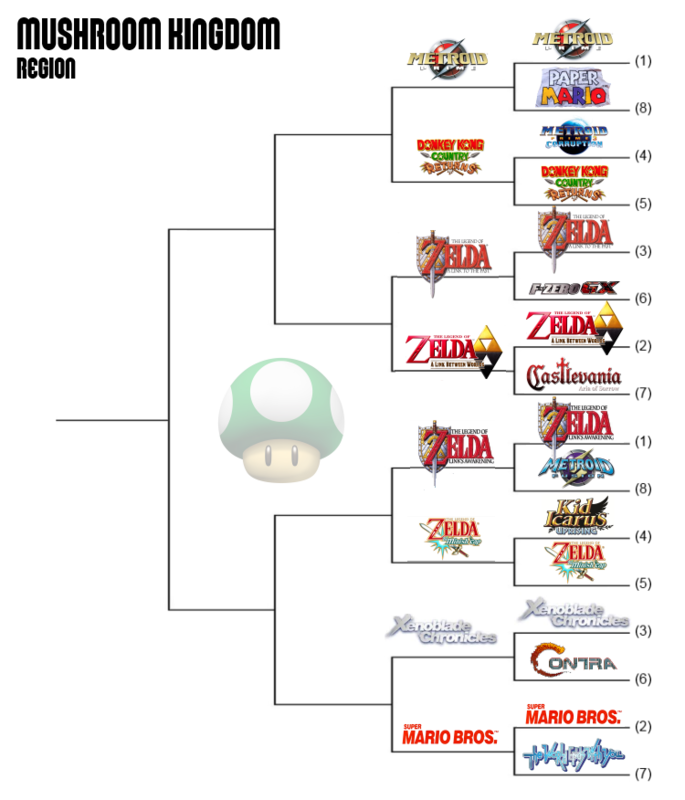 While I like Link's Awakening a lot, it's just not as fun for me as the three other 2D Zelda games in this bracket. B2. No strong feelings for either game. I liked the part of Xenoblade that I played more than Mario. A1: I'm one of the biggest DKCR fans here, but even I have to know when to back down. Returns is exemplary, but Prime is revolutionary. A2: This made me stop and think for sure. I think LttP is actually kinda showing its age, especially after LBW. Even so, I ultimately think it was the bigger accomplishment and a landmark installment in the series, even if LBW tweaked a lot of its issues. B1: LA is one emotional ride, I kinda wish this one was going against ALttP/LBW next time. I'd vote for it. B2: Gotta go with the first game I played and one that wrote many of the rules that still apply today. Xenoblade versus Super Mario Bros.? Gah, hardest pick so far! But, I have to go with Xenoblade. Super Mario Bros. is a work of genius, and one of the most important games out there, both for me personally and for gaming as a whole, but the way Xenoblade swept me off my feet and kept me obsessed for several months is something practically non-existent for me these days.